Jeremy Hummel is quickly becoming one of the most sought after studio drummers in the recording industry. 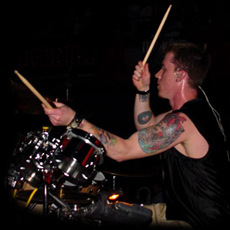 As a founding member of the national rock band Breaking Benjamin, he composed and recorded all drum and percussion parts for the band's first two albums, including 2004's platinum-selling, "We Are Not Alone." Amongst his recorded work are five singles that charted on the Billboard US Modern Rock and US Mainstream Rock charts. Highlighting these singles were "So Cold" and "Sooner or Later", both of which reached #1 on the Active Rock charts in 2004. Several of his recorded tracks appear on various popular video games for the PlayStation 2 and Nintendo Gamecube video systems, Guitar Hero, and Rock Band. Please contact Jeremy at jeremyhummel@hotmail.com to discuss your recording needs. "Jeremy Hummel is a triple threat. He has learned the art of groove and ensemble playing combined with real chops as a drummer. He is a rare find." "In the studio session world, Jeremy is like a one stop shop. His groove is impeccable, and he can play any style you throw at him. I have yet to stump him with that. He also has a huge vocabulary of music that he listens to which is incredibly helpful when you are trying to suss out new ideas. I guess some people enjoy editing drums....I don't. I just call Jeremy, and it's done." "Jeremy Hummel is equal parts bombast and finesse. He's just as likely to ride hard on his China as he is to tap out an intricate riff on a 6" effects cymbal. He's as interested in "bringing back the gong" as he is in developing more finesse and subtlety on the kick drum. But even with a casual listen, you can tell that Hummel is a drummer's drummer, crafty and aggressive, but never self-indulgent." Send Jeremy a WAV File and have it returned with great drum tracks. Contact Jeremy today to get started.